Hayastan All-Armenian Fund completes eyecare project across 21 communities in Armenia’s Shirak Region. 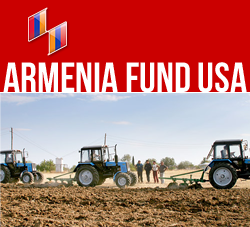 NEW YORK, New York — The Hayastan All-Armenian Fund, in collaboration with the French-Armenian Doctors’ Association, completed a large-scale eye care project throughout the 21 rural communities of Ashotsk, an area in Armenia’s Shirak Region. During the project, which was carried out from August 12 to 17 through mobile clinics, 262 children of preschool and school age were given eye exams and prescription glasses. The comprehensive tests were administered by ophthalmologists from the French-Armenian Doctors’ Association and using advanced ophthalmic equipment and instruments. The prescription glasses were produced onsite and fitted by teams of optical technicians who had accompanied the doctors to Armenia. The initiative also benefited a large number of senior citizens in the area. Based on preliminary check-ups conducted by nurses across the villages of Ashotsk, 861 seniors underwent eye exams and received prescription glasses.